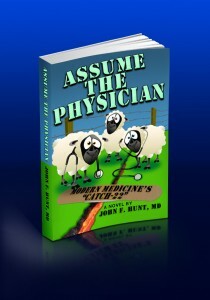 Purchase ASSUME THE PHYSICIAN in print version here on the website, or at Amazon. If bought here, more revenue gets directed to charity (the money that Amazon would get instead goes to orphans and women and entrepreneurs in Liberia. This entry was posted in Uncategorized and tagged Assume the Physician, boo, Catch-22, House of God, John F. Hunt, John Hunt. Bookmark the permalink.